Owned by Kel and Janelle Boynton, Feathertop is a modern winery estate located in Victoria’s High Country, three hours north east of Melbourne. Our rolling vineyard and modern accommodation facilities sit amongst native forests with the dramatic backdrop of the Victorian Alps. Awarded a 5 Star Winery in the James Halliday Australian Wine Companion 2014, 2015, Feathertop prides itself on providing warm and friendly hospitality and a stunning location to stay. 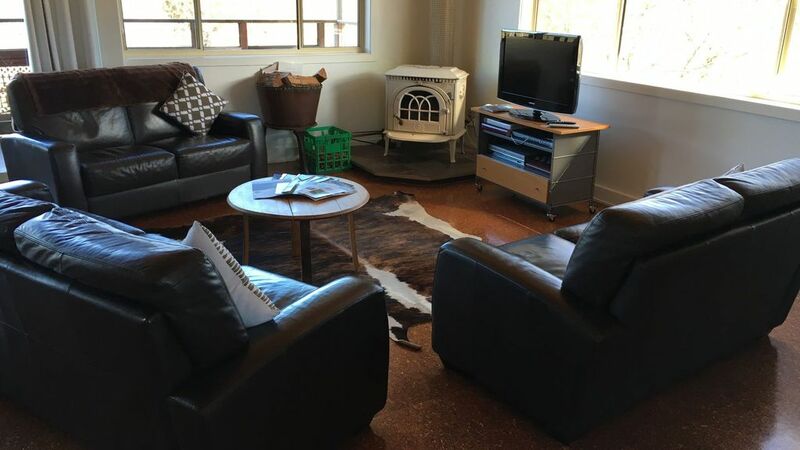 The Mt Buffalo View Apartment lets you experience luxury and style in the vines and the excitement of staying at working family winery estate. The open plan 2BR apartment provides ample space to entertain or relax, with features including a clean, modern kitchen with Smeg and Miele appliances, espresso machine, private balcony with BBQ, wood fire heater, split system air conditioning, a spa bath and amazing views of the vineyards and of course Mt Buffalo. If it’s rest and relaxation you are after, we can arrange your own in-house massage therapist to come to your private treatment room in the apartment. For the more adventurous you can see first hand the activity of a family owned winery – from the hum of cellar door, to vintage, picking grapes, moving wines and even some pruning. Your room rate includes a selection of the finest locally made produce items and pasta for a quick meal, a bottle of Feathertop wine and breakfast supplies. If you don’t feel like cooking, book a table in the Feathertop Alfresco Dining Restaurant (featured in The Age Good Food Guide 2014) which is open year round for lunch. Or perhaps you might like to sit back and enjoy the sun setting over the mountains with a glass of wine and a local produce deli platter on the terrace or take away to enjoy on your own private balcony – the choice is yours at Feathertop. Named in honour of Kel Boynton’s mother, the archtiecturally designed Peggy Adelaide suite offers an experience of ultimate indulgence and relaxation, perfect for that romantic weekend getway. The spacious one bedroom suite features a king size bed that opens out to a private balcony complete with a free-standing outdoor bath and heater. The interior is superbly styled so you have all the modern luxuries at your disposal including a resort style bathroom with LED rainwater shower, a large flatscreen TV, iPad, built in robes, coffee machine, local produce goodies and kitchenette. To book our Peggy Adelaide Suite, search Property ID: 9150578. We loved the Mt Buffalo apartment. Exactly as the photos depict. Comfortable beds with quality linen. Morning tea on the balcony overlooking Mt Buffalo. What more could we want ! Oh yes, and I forgot to mention living above the winery as definite advantages ! We had a fantastic stay at featgertop, beautiful accommodation with a great view, friendly staff and amazing welcome hamper. We loved our short stay here. The staff were very friendly, the room had everything we needed and more! The kids could go and play in the playground and we could watch from the balcony with a glass of wine in hand. Close to Bright, the snow and everywhere you want to go! The best view to wake up to. Great location. Very welcoming. Our stay was fabulous. The apartment is beautifully appointed and very comfortable with everything you need. The restaurant is exquisite with exceptional food and wines from the cellar door, the owners and staff were very accommodating, nothing was too much trouble and we were made to feel so welcome. I would highly recommend and will visit again.